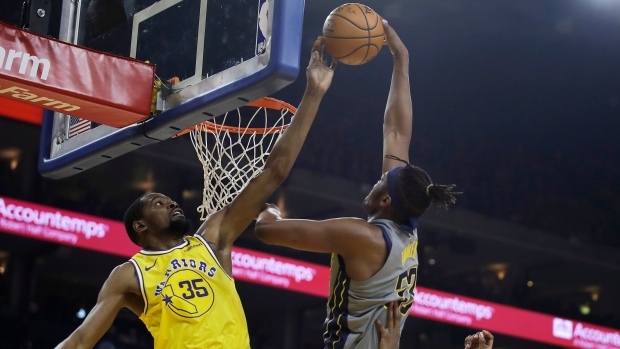 OAKLAND, Calif. — Kevin Durant established Golden State's defensive energy by swatting away shots early. Eventually, the Warriors got going on the other end as they almost always do. The Warriors, whose defence has become a greater focus with the playoffs approaching, have allowed their fewest points in two of the past four games. Oklahoma City scored 88 points Saturday before the two-time defending champions held down Indiana. "I think our fans recognize that, in many ways, Andrew represented the shift in the Warriors organization and its emphasis on defence," Kerr said. "I think that trade was really kind of the first domino to fall in terms of — well Steph's drafting was the first one, let's not forget that one — but shortly thereafter Andrew came over in the trade and there was an organizational shift toward a defensive mindset which I think Mark Jackson implemented and the players started to reflect that philosophy." Warriors: All five Warriors starters scored in double figures for the fourth time, with Golden State winning each of those. ... The Warriors won 132-100 at Indiana on Jan. 28, getting 39 assists and shooting 54.1 per cent and going 13 of 31 on 3s. ... Golden State is 27-4 when notching 30 or more assists (32 on Thursday). ... Bogut is three regular-season games shy of 700 in 14 seasons.